Volume 22 of THE ADDRESS Magazine is a 472-page celebration of living the good life. As one of the leaders in style and class, this luxury “coffee table” magazine showcases some of the world’s finest properties for sale, stretching across the globe from exotic destinations to sleek winter landscape, from vibrant cities to great weekend getaways. Looking for a primary residence or a second home, THE ADDRESS Magazine delivers precise and relevant information in an award-winning format that lavishes the reader with spectacular photography and engaging editorial. The Food & Travel section features alluring destinations, Winter Vibe, a stylish photo essay as well as tantalizing cuisine, noteworthy chefs, and memorable restaurants. Highly exclusive and desirable, luxury French Riviera properties are among the most sought-after real estate in the world. The French Riviera is renowned as one of the world’s most beautiful and glamorous areas and is blessed with an exceptionally clement climate. 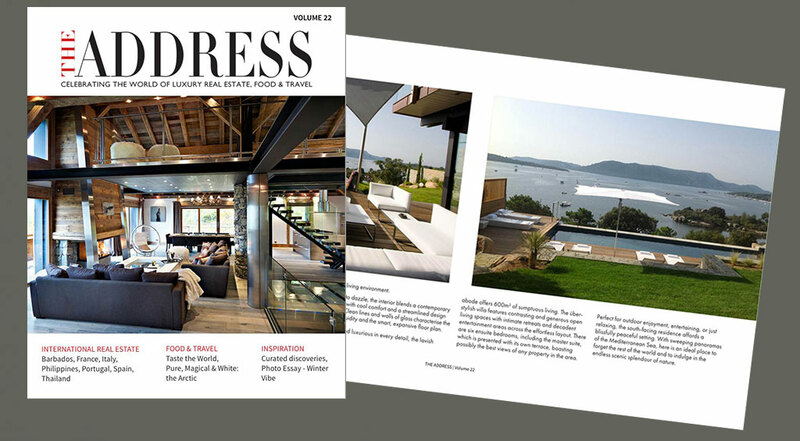 This issue of THE ADDRESS luxury real estate magazine is an essential resource to true lovers of prestige property who are seeking luxury homes, mansions and villas for sale on the French Riviera. Making an elite lifestyle statement, do not miss the extraordinary waterfront villa that epitomises the exquisite and exceptional. With an unsurpassed elegance and a coveted address, this is a world-class trophy property. A dazzling architectural triumph, readers will also find an ultra-modern home for sale in Villefranche. With streamlined design and sweeping views, this sensational home is all about a privileged lifestyle. Blessed with glorious year-round sunshine, the Algarve is laced with luscious landscape, stupendous sandy beaches, fabulous golfing, and a lovely Mediterranean feel. Thanks to the region’s natural wealth and beauty, Algarve properties draw a steady influx of international retirees, professionals and property investors. The highlight of Algarve real estate in this issue is a show-stopping mansion villa, that represents the pinnacle of luxury and architectural brilliance in terms of Algarve real estate. For British high-life infused with West Indian culture, lots of sunshine, and superb hospitality, Barbados ticks all the boxes. As the jewel of the Caribbean, the island is now a centre of gastronomy and sport, history and culture, and Barbados real estate is in high demand. This issue of THE ADDRESS Magazine showcases an impressive collection of luxury tropical homes for sale including a historic country home, a luxury villa for sale in Barbados’ Sugar Hill Resort, and a luxury ocean view penthouse. Blessed with beautiful nature and extraordinary Mediterranean quality of living, properties in Costa Maresme, Spain is highly sought after and endlessly popular. Looking for that perfect primary residence or a holiday home on the Maresme Coast, do not miss this issue’s carefully selected properties, including a period house, a superior family villa and a luxury vacation home. With a landscape speckled with luxuriant gardens and sparkling water stretching off into the distance, the Italian Lakes is the quintessential holiday home destination. Villas and apartments in the Italian Lake district are recognised for stunning scenery and lake views and attract an international clientele seeking luxury homes for sale. Over the years Paris has remained one of the pre-eminent and most desirable cities in Europe with Paris real estate continuing to attract international buyers. As a world leader in style, elegance, and sophistication, Paris properties are always fashionable, always wanted. In this issue of THE ADDRESS Magazine, we have selected three Parisian properties where one can enjoy the ultimate city based chic lifestyle. With the 2015/16 ski season upon us, seasoned skiers and astute lifestyle investors alike will be considering alpine property investments in France. France is not only the top ski destination in the world, it is also a great place to invest in property. Ski properties in the popular resorts are always a desirable commodity. In this issue, we are showcasing great ski chalets for sale in some of the the finest and most luxurious resorts such as Méribel and Val d’Isère. The search for the pinnacle of lush, tropical living is over. THE ADDRESS Magazine offers the chance to own prime property in the popular Phuket holiday real estate market. Despite the rapid development throughout the island, the supply of exceptional ocean view homes on the West coast is limited, and with demand continuing to rise the value of such properties is sure to increase accordingly. Purchasing a sea view villa in Phuket as a holiday home, investment or as a place to live really is the epitome of class and sophistication. 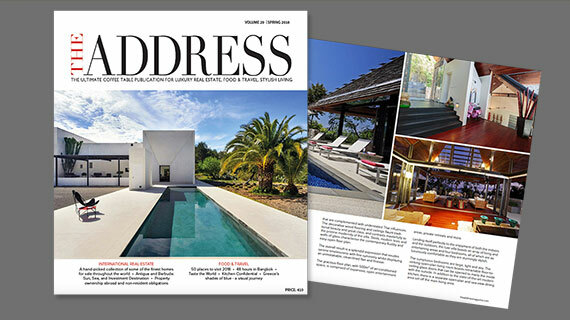 Also, in this issue of THE ADDRESS Magazine readers will find a beautiful modernist home for sale in Barcelona; an immensely beautiful castle for sale in the Catalan countryside; an ultra-modern prestige property for sale in Corsica; a dream Costa Blanca country house for sale; one of the finest waterfront properties for sale in Liguria; Lisbon luxury brand new apartments for sale with central city location; and a Philippines 5-star residential resort apartments for sale. The market insight features in this issue include “Spain’s holiday rental laws – all you need to know before renting out your vacation home” and “Reforms to the taxation of non-UK domiciled individuals”, plus 15 Property Market Insight articles. THE ADDRESS Food & Travel section is the ticket to some of the world’s most fascinating destinations. The Arctic remains one of the world’s uncharted regions, and in this issue there is an opportunity to escape to the ‘kingdom of the polar bear’ where the scenery is remote but on an epic scale. Explore epicurean inspirations; from hidden gems to perennial classics, from simple delights to refined pleasures. THE ADDRESS Magazine shares some of their food and travel discoveries to be included on anyone’s must-to-do list. Join us on a journey from Athens to Tokyo. The foodie inspired luxury lifestyle publication features in each issue profiles and interviews with a leading chef, plus two signature recipes. Talented chef Akira Shimizu sits down with THE ADDRESS Magazine to talk about favourite ingredients, guilty food pleasures and much more. Finally, explore our photo essay ‘Winter Vibe”, which with its rich visual narration, celebrates the beauty, majesty, magic, purity, serenity and stillness of the winter season. Click the link to enjoy the latest issue of THE ADDRESS Magazine, celebrating luxury homes and lifestyles around the world.